The Industrial Internet of Things (IIoT) is flooding today’s industrial sector with data. Information is streaming in from many sources — equipment on production lines, sensors at customer facilities, sales data, and much more. Harvesting insights means filtering out the noise to arrive at actionable intelligence. This report shows how to craft a strategy to gain a competitive edge. It explains how to evaluate IIoT solutions, including what to look for in end-to-end analytics solutions. 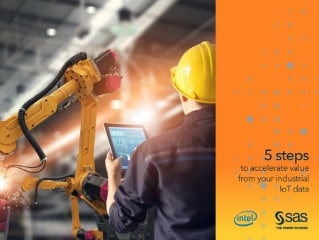 Finally, it shows how SAS has combined its analytics expertise with Intel’s leadership in IIoT information architecture to create solutions that turn raw data into valuable insights.